Artificial grass is a manufactured artificial material designed to replicate natural grass. The artificial material of fibers consists of a mixture of polyethylene and polypropylene UV inhibited polymers made to look like natural grass. Originally artificial grass also known as synthetic grass was used in sports grounds that required replacement of natural grass. In recent years the advancements in manufacturing technologies have allowed artificial grass to become very realistic and softer and now lends itself more to residential landscaped environments. 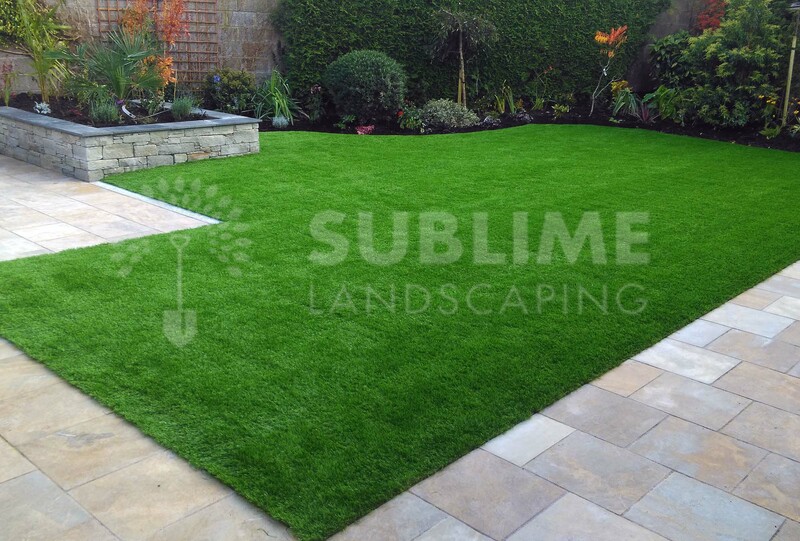 For this reason artificial grass has become extremely popular for domestic and commercial applications. Artificial grass, commonly known in Cork as fake grass is ideal for areas of poor drainage due to poor soil, shaded areas under trees, balcony areas, roof tops, special needs areas, preschools, creches, sports grounds, playgrounds, exhibition stands, grave yard plots, offices and many more options where a natural lawn is not achievable due to surrounding factors. With low maintenance in mind, it is important to highlight that artificial grass for example will render a muddy domestic garden usable and mud free 12 months of the year, especially when considering the damp weather conditions here in Cork during the winter months. This is a major plus for anybody with kids that love being outdoors.